The solid stone of the grave hinting at the power death has over us. Don't be afraid. The crucified Jesus is Risen - just as He said. Fear has such a hold over us. We have to allow the resurrection speak to our fears. Come and see. He's not here! 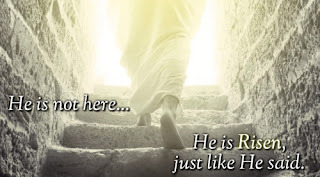 Although time is of the essence (he will tell them to go quickly to the disciples), there is time and place for the woman to be certain that Jesus is not there - that He is risen. In a time where the bodily resurrection seems to be negotiable for some theologians, we, with the women, are urged to absorb and appreciate the fact that the tomb is empty. Go and tell His disciples that He's going ahead and they must follow to see Him. It really is true that we see and experience the Risen Jesus best when we are following in His steps rather than waiting for Him to "prove" Himself to us. I love the little phrase at the end of the angel's sermon: "Now (Behold/See) I have told you." It's as though he's saying "See! I've done it! I've faithfully discharged my duty, now so must you..."
This brings us to the end of the Lent 2019 series. I pray it has been a blessing to you. I'll be taking a break from e-devotions until May. All the pain and guilt of broken humanity inflicted on the One who had done nothing wrong. We've been reading through the Gospel of Mark through Lent. God bless you on this GOOD FRIDAY. 15 At dawn’s first light, the high priests, with the religious leaders and scholars, arranged a conference with the entire Jewish Council. After tying Jesus securely, they took him out and presented him to Pilate. 2-3 Pilate asked him, “Are you the ‘King of the Jews’?” He answered, “If you say so.” The high priests let loose a barrage of accusations. 4-5 Pilate asked again, “Aren’t you going to answer anything? That’s quite a list of accusations.” Still, he said nothing. Pilate was impressed, really impressed. 6-10 It was a custom at the Feast to release a prisoner, anyone the people asked for. There was one prisoner called Barabbas, locked up with the insurrectionists who had committed murder during the uprising against Rome. As the crowd came up and began to present its petition for him to release a prisoner, Pilate anticipated them: “Do you want me to release the King of the Jews to you?” Pilate knew by this time that it was through sheer spite that the high priests had turned Jesus over to him. 11-12 But the high priests by then had worked up the crowd to ask for the release of Barabbas. Pilate came back, “So what do I do with this man you call King of the Jews?” 13 They yelled, “Nail him to a cross!” 14 Pilate objected, “But for what crime?” But they yelled all the louder, “Nail him to a cross!” 15 Pilate gave the crowd what it wanted, set Barabbas free and turned Jesus over for whipping and crucifixion. 16-20 The soldiers took Jesus into the palace (called Praetorium) and called together the entire brigade. They dressed him up in purple and put a crown plaited from a thornbush on his head. Then they began their mockery: “Bravo, King of the Jews!” They banged on his head with a club, spit on him, and knelt down in mock worship. After they had had their fun, they took off the purple cape and put his own clothes back on him. Then they marched out to nail him to the cross. 40-41 There were women watching from a distance, among them Mary Magdalene, Mary the mother of the younger James and Joses, and Salome. When Jesus was in Galilee, these women followed and served him, and had come up with him to Jerusalem. 42-45 Late in the afternoon, since it was the Day of Preparation (that is, Sabbath eve), Joseph of Arimathea, a highly respected member of the Jewish Council, came. He was one who lived expectantly, on the lookout for the kingdom of God. Working up his courage, he went to Pilate and asked for Jesus’ body. Pilate questioned whether he could be dead that soon and called for the captain to verify that he was really dead. Assured by the captain, he gave Joseph the corpse. 46-47 Having already purchased a linen shroud, Joseph took him down, wrapped him in the shroud, placed him in a tomb that had been cut into the rock, and rolled a large stone across the opening. Mary Magdalene and Mary, mother of Joses, watched the burial. This year I found three images that have been so evocative of the feelings I have around Holy Week. The second one is related to Good Friday. I use highlighting pencils to mark my Bible as I read. One year I decided to highlight any references to Jesus' suffering in purple as I re-read the Holy Week account in Mark's Gospel from Palm Sunday to the resurrection. I looked for obvious and not-so-obvious descriptions of Jesus' suffering. The obvious ones were easy: The beating and mocking at the hands of the soldiers, hearing the crowd cry "crucify", carrying His cross and then hanging on it, and more. The not-so-obvious ones included the times Jesus was not recognised for who He really was, where He saw the Court of the Gentiles being used as a market-place, where the Pharisees tried to catch Him out like a common conman, and the disciples who scolded the woman who anointed Him with perfume, calling her act of love a waste. There's a lot of purple in Mark 11-16 in my Bible. I grew up in the era that didn't feel we should portray Jesus. One of the most incredible scenes in the classic version of "Ben Hur" is the one where Jesus gives Ben Hur a drink of water, and while He is not portrayed, His life-changing influence is clear. Portraying Jesus on the cross is a stretch for me. 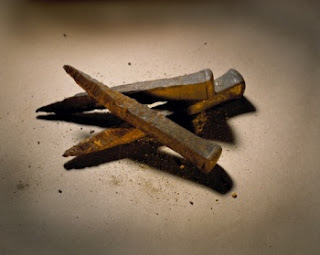 We could say that Jesus was nailed for our sin. We could say that the cross was the last nail in His coffin. We could say that He nailed sin, death and Satan. We could say that He is as tough as nails. And we should imagine holding those nails and a hammer in our hands. We should imagine being pierced by those nails. We should imagine trying to deal with all of life's nails alone. And we should say - thank You Jesus for what you did for me! Then he saw what the nails had done to Jesus. Now Thomas (called Didymus), one of the Twelve, was not with the disciples when Jesus came. 25 So the other disciples told him, "We have seen the Lord!" This year I found three images that have been powerfully symbolic of the message of Holy Week. The first one is related to Palm Sunday. Jesus was an 'unexpected' Messiah for the Jews. They had expected a political figure who would chase the Romans into the sea, establish an earthly throne in Jerusalem and set up a kingdom that the likes of King David would only have dreamed about. When Jesus came and established a heavenly kingdom - a kingdom of the heart - many expectations were disappointed. Some even suggest that Judas betrayed Jesus to "force His hand" - to propel Him into taking the route of power and conquest instead of humility. But there is an old prophecy in Zechariah that was missed by the religious establishment... In contrast, to a King on a Stallion, the Messiah comes riding a donkey's foal. What connotations come from riding a donkey's foal? It was mode of transport for the elderly or children. It would be the mount chosen by a soothsaying prophet or a wise hermit. Riding a donkey is not the declaration of war, but a statement of the intent of peace. This was Jesus' mode of transport on Palm Sunday as He entered Jerusalem. It was a week before Passover, Jerusalem was full of pilgrims, they were remembering the miraculous Exodus from Egypt and so nationalistic fervour ran high. Jesus sent a crystal clear message on that day: His kingdom was not an earthly kingdom. He was not willing to go to war to obtain peace. He came not as a Victor, but a Victim, and He would grant salvation by giving Himself. Look at His title, consider His nature and the gift He bears. Consider His message: "I am the servant who brings peace by laying down my life." And then "Rejoice greatly" and "Shout!" Rejoice greatly O Daughter of Zion! 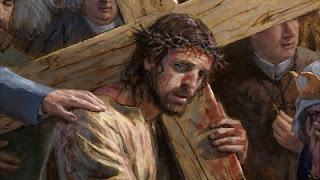 We're still considering the "Via Dolorosa" (the Way of Suffering) that Jesus walked to the cross. Because Jesus embraced our suffering James, Paul, Peter and the early church were able to face suffering too. Yesterday we saw how James recognised that trouble comes, but can be faced with joy because we can grow through it and ask for wisdom as we need it. 2. But Peter was also convinced that trials and trouble offered an opportunity to grow. When gold is melted, the heaviness of its molecules means that all other impurities (the "dross") float to the top, leaving pure gold underneath. When we go through trouble, it brings an amazing clarity about the things that really matter and focuses our priorities like nothing else. 3. The other amazing thing about suffering is that God draws us near to Him in a way that defies logic and understanding. Although the trouble can make us feel far from God, we can emerge from a time of trial loving Him more and being more certain of his presence. This is the counter-intuitive aspect of our faith - our troubles don't diminish our hope but increase it: "Though you have not seen him, you love him; and even though you do not see him now, you believe in him and are filled with an inexpressible and glorious joy..."
Now read through the passage with these three points in mind and then pray with me: "Dear Lord, it's easy to lose hope when trouble comes. Help me to keep the bigger picture in mind. Thank you that trouble helps me to see the things that really matter. Help me to draw near to You and fill me with the courage+hope+purpose=joy that I need. In the name of the One who walked the Via Dolorosa. Amen. One of the great comforts of Easter is the "Via Dolorosa" - the road of pain and suffering that Jesus walked. 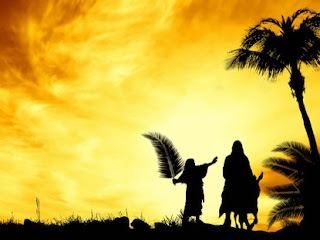 For this week of Lent leading up to Palm Sunday, we're going to spend a bit of time considering our trials and trouble and how Jesus embraced our pain on the cross. Our first guide is James. This is not James the brother of John who was a disciple. (That James was martyred in about 44 AD) This is James the son of Mary and Joseph, brother of Jesus. James considered his older brother to be deluded and so only came to faith when Jesus appeared to him after rising from the dead. He quickly rose to prominence as a leader in the early church and would eventually be martyred in about 62AD. Firstly, James doesn't talk about suffering as a "maybe" or a "possibly". He talks about trials and trouble as a "whenever". We are not promised a trouble-free life. Many of us spend overmuch time contemplating why trouble has come our way instead of recognising that we're in the company of Jesus, the early church and the heroes of the faith when we go through tough times. In the third place, God brings good out of our trouble. Later on in verse 13, James makes it clear that God is not the author of trouble, but He transforms it. Our trouble may seem a muddy bog, but in God's hands, mud becomes clay and can be formed into beautiful vessels. Trouble leads to Perseverance, Maturity and a Crown of Life. Finally, trouble can shake our foundations. If it didn't, it would not be so troublesome. And so we're invited to ask for help (wisdom) in the midst of our trouble. The problem is that we often are driven by our emotions (up and down like the waves of the sea) when we have doubts. We can ask for wisdom, but we can't let our emotions drive the bus. Now read through the passage with these four points in mind and then pray with me: "Dear Lord, there are times that trouble comes uninvited and unexpected. Help me to handle my trouble maturely and to grow through it. Give me faith in You, clarity of Your purpose for my life and hope that You will defeat all trouble. When my emotions want to drive the bus, give me the wisdom I need. I pray this for those around me going through tough times too. In the name of the One who walked the Via Dolorosa. Amen.